Summary: From the author of Maybe in Another Life—named a People Magazine pick—comes a breathtaking new love story about a woman unexpectedly forced to choose between the husband she has long thought dead and the fiancé who has finally brought her back to life. For my flight to Florida, I decided to read something "light." I was on my way to a week of theme parks with my family, and I knew I wanted a book that was easy-to-read. 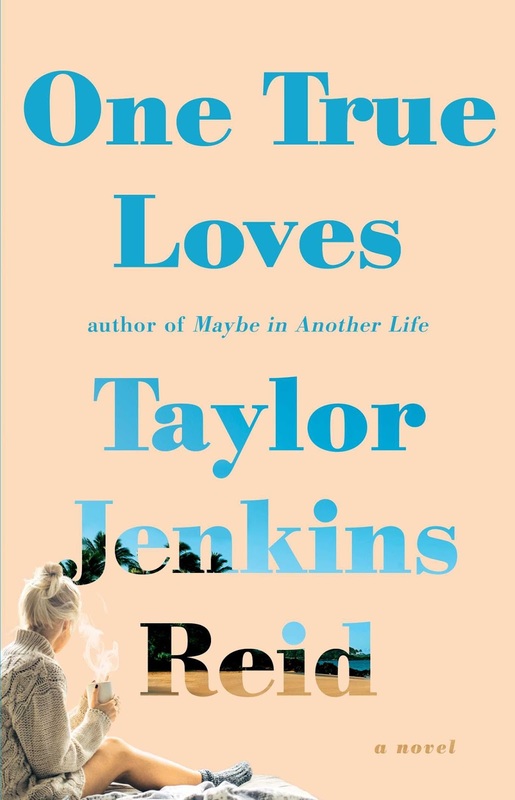 I decided to pick up ONE TRUE LOVES by Taylor Jenkins Reid. It was absolutely the perfect choice! In fact, I finished up the novel right as we started to line up to exit the plane. ONE TRUE LOVES tells the story of Emma Blair. She was happily married to her high school sweetheart Jesse. Both couldn't wait to get away from the pressures and constraints of their home town. They even choose careers that allow them to travel all over the world, and they embraced not being tied down so they could experience adventure after adventure. On their first wedding anniversary, Jesse is flying over the Pacific for one of his jobs when the helicopter goes missing. The bodies of the other people on the aircraft were found; however, Jesse wasn't. Of course, he was thought to be dead. Emma's life is turned upside down in an instant. She has lost the love of her life! She decides to return home until she can figure things out. She begins working with her parents in their bookstore (a job she would have sworn she'd never do), and she begins to pick up the pieces of her life. And then Sam enters the picture... Emma knew Sam back in high school but she wasn't interested in him; however, he might be exactly what Emma needs. He is stable and kind, and Emma finds herself falling in love with him. When he proposes, Emma realizes that she has been given a second chance at happiness. As Emma's life is finally falling into place, she receives a phone call from Jesse! He's alive and has been surviving on an island in the Pacific for years. He is desperate to come home to her, and Emma is happy to know he's alive; however, she has moved on... and loves Sam. WOW -- just wow! Emma is forced to make a huge decision that she knows will hurt one of the men in her life. Not only does she have to pick either Jesse or Sam, she also has to figure out who she is and what she wants out of her life. I adored ONE TRUE LOVES! It was a quick read, not because it didn't delve into some serious issues, but rather because it was so enjoyable to read. I loved the premise of the novel, and I really liked the characters. All in all, it was a terrific summer read! One of my favorite things about this novel was the character of Emma. Naturally, my heart went out to her for losing her husband and then finding out he was still alive. Emma truly believed Jesse was her soul mate, and she was definitely conflicted when he returned to her. Emma never stopped loving Jesse even though she fell in love with Sam, but her life had moved on while Jesse was (literally) stuck in one place. While the story appears at face value to be about Emma and who she would pick to spend the rest of her life with, it really was a coming-of-age story for Emma. Emma definitely had changed since the loss of her husband, going from a woman who couldn't wait to leave her hometown and her parents' book store, to one who realized the value of her family, her hometown, and even her parents' business. The "new" Emma definitely wasn't the same one that Jesse left years ago. I also loved how this book explored love. I think we all remember our first love and just how intense it was. Well, Emma and Jesse's entire relationship was pretty much at that intensity... or at least they thought it was. When Emma fell in love with Sam, it was a different type of love but no less important or valuable. I felt as if the author did a great job of showcasing the different types of love and emotions. ONE TRUE LOVES would make a fun book club selection for your group this summer. The book is very entertaining and does pose some interesting questions... not only for Emma but also about love and life in general. I wasn't able to find a discussion guide, but some of the themes you might want to explore include love, the idea of soul mates, grief, family, second chances, and more. Overall, I thought ONE TRUE LOVES was a really good book. There is an obvious reason that this book is listed on the Best Book of Summer lists by Cosmopolitan, InStyle, Redbook, Us Weekly, PopSugar, Buzzfeed, Bustle, and Brit+Co.Highly recommended to fans of women's fiction. I received an e-copy of this novel from Netgalley and the publisher. I know so many people who love her work so I listened to one of her books. I liked it but thought it was a little predictable. It sounds like I need to try another one of her books soon! It sounds like a nightmare! Well, I would be absolutely torn apart by such a decision. I'm glad you enjoyed this one. I need to find an easy to read, fun book for summer reading. I liked this one - as much as all of her books. She really knows how to tell a story, doesn't she?